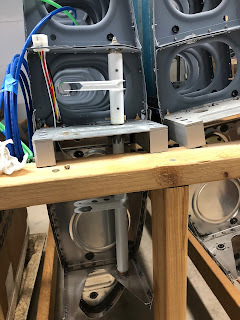 I spend a couple hours hunting and gathering electrical components this morning. 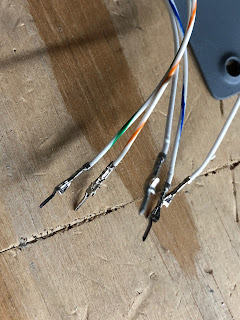 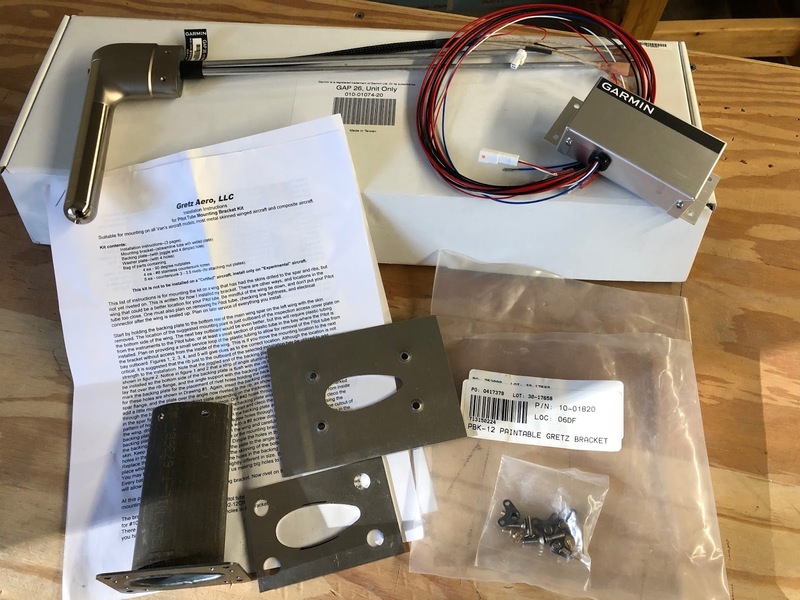 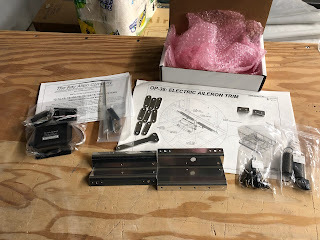 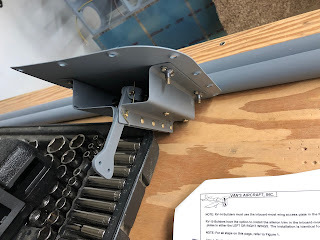 I ordered molex connectors for the wing tips, molex pins, shrink insulation, heat gun, crimp on connectors and Dymo wire label shrink tubing from Amazon. I've been trying to get as much finished in the interior of the wings as possible before riveting the bottom skins. 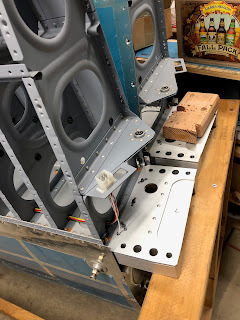 I could probably do a lot of tasks by reaching in through the access holes, but it is MUCH easier with the skins off. 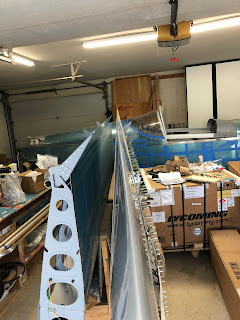 I'm now waiting for parts to arrive from Amazon and Aircraft Spruce and hopefully I'll be done with interior work by the end of next week. 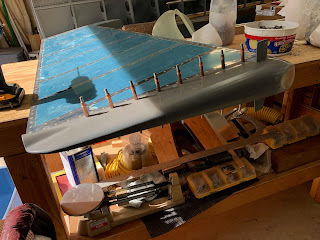 This afternoon I trimmed the left wing tip and fitted it to the wing. 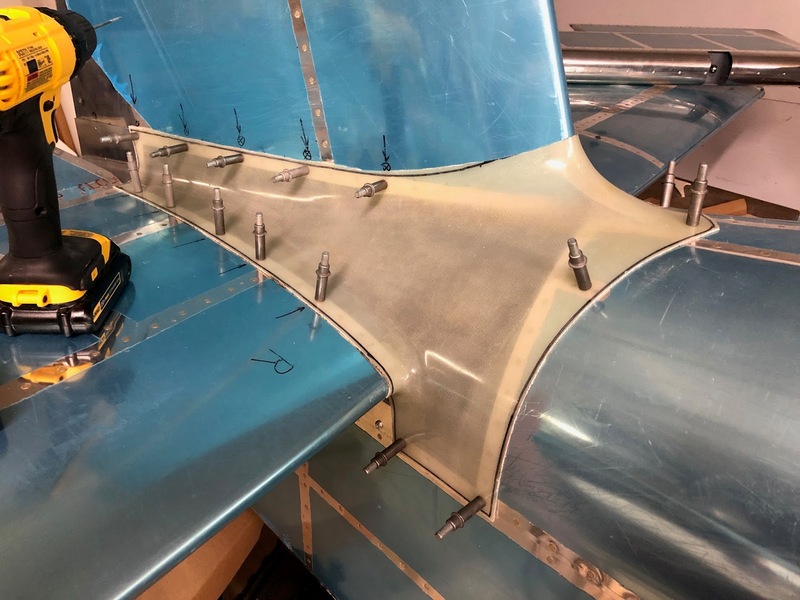 The first step was to bolt the rigging template to the end of the aileron to hold it in the neutral position. I fabricated a half washer and added a couple spacing washers to space the template from the end of the wing before tightening the nut. 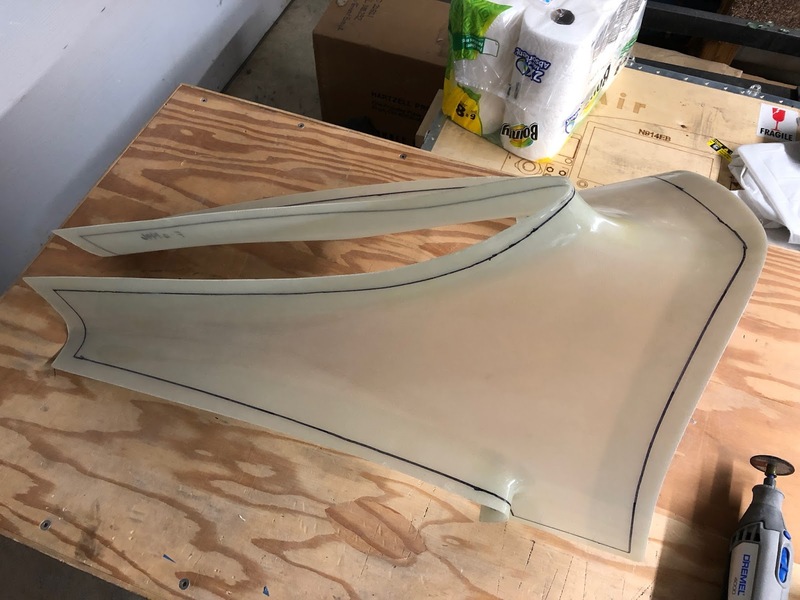 Then I used masking tape to hold the template on the aileron. 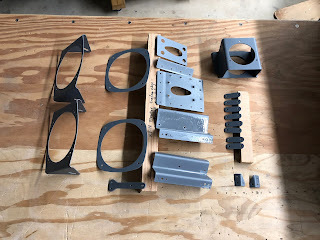 It took 3 or 4 trim, mount, mark and re-trim sessions to get an acceptable fit. 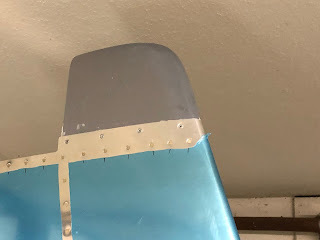 I used a strap to apply (gentle) pressure to force the wing tip into the leading edge of the wing. I also used duck tape to help pull the tip flush into the end of wing. 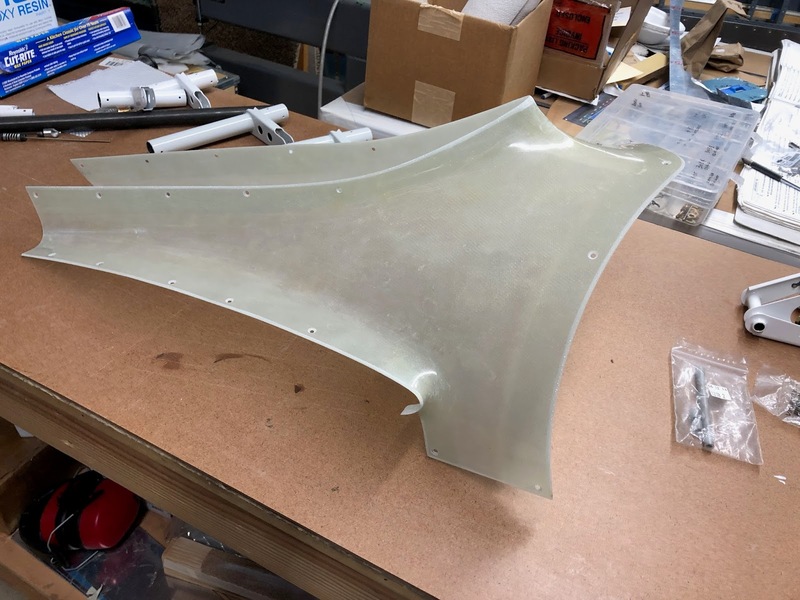 The fiberglass is very flexible and is easy to coerce into shape. 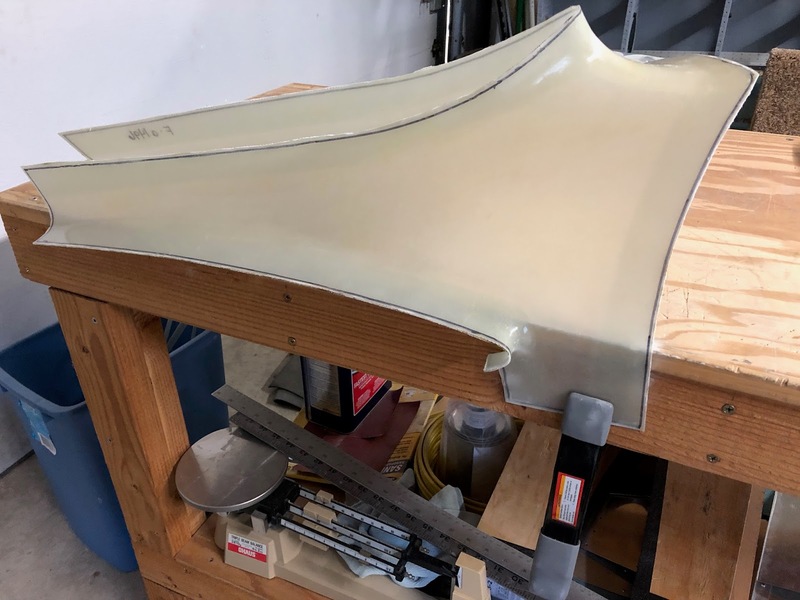 I had read several blogs where the builders had to split the trailing edge of the tip to get it to line up with the aileron trailing edge. 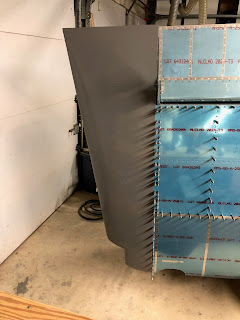 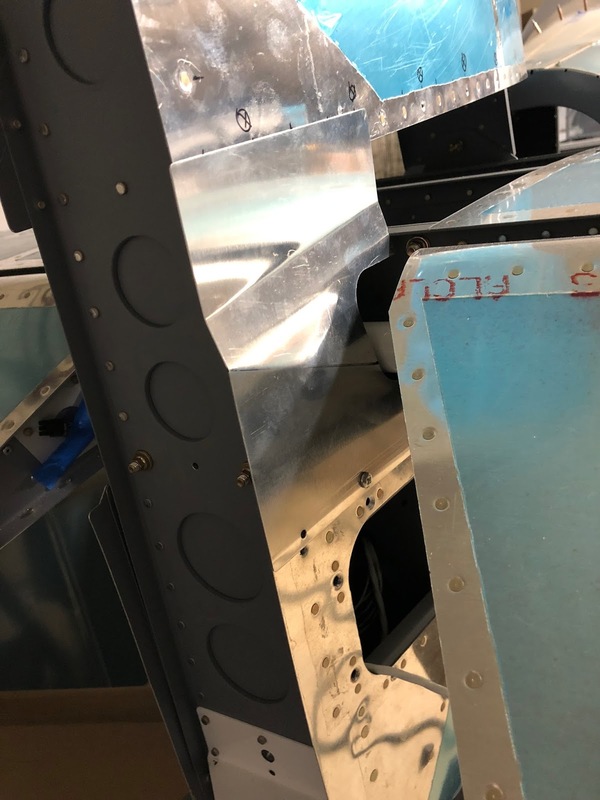 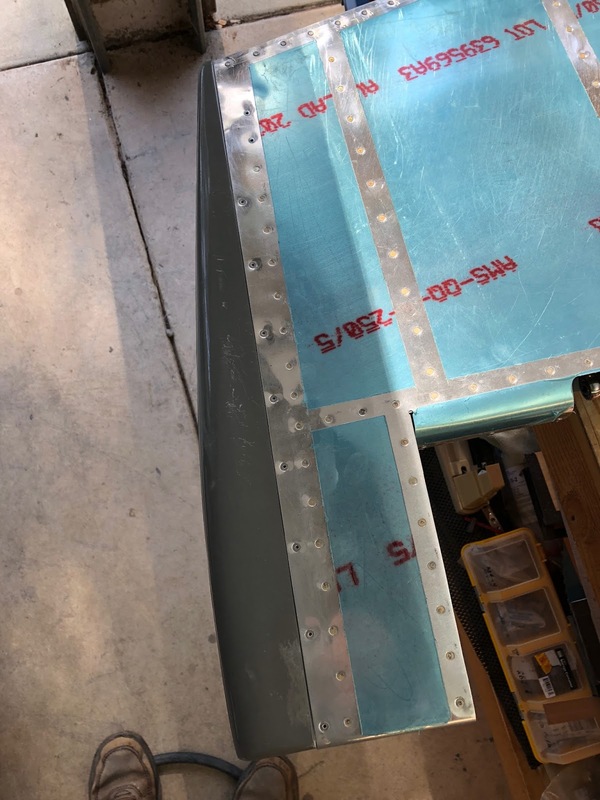 I discovered that depending on how you pull the lower and upper edges of the tip into the wing skins you can cause the trailing edge to move several inches up or down. I squared up the inside edge of the flanges where they meet the wing skins using a sanding block to get a closer fit. 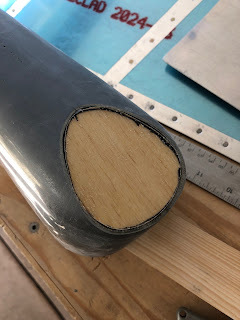 Then I carefully used duct tape to pull the tip in for as close a fit as possible. It took a couple times of sanding and looking for interference points before I got a decent fit. Then I used duct tape to pull the tip in as close possible. At this point the trailing edge was very close to alignment with the aileron trailing edge (see picture above). 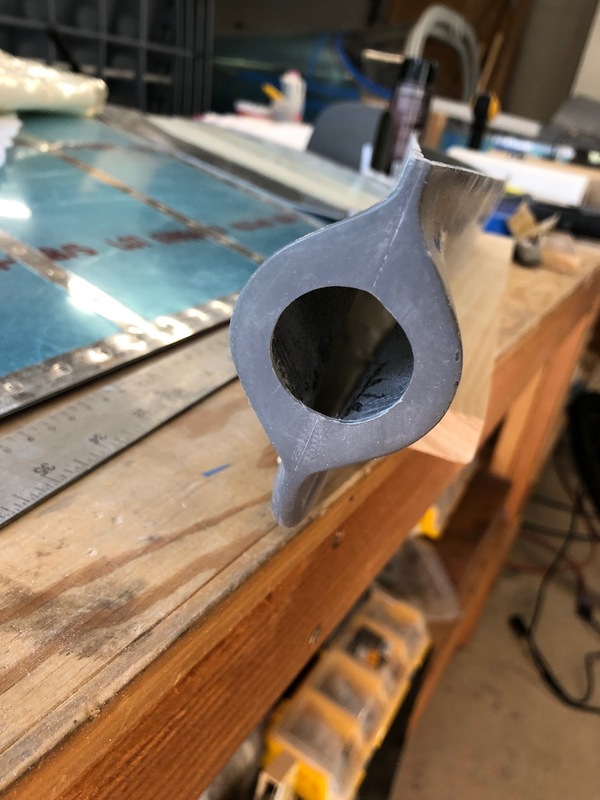 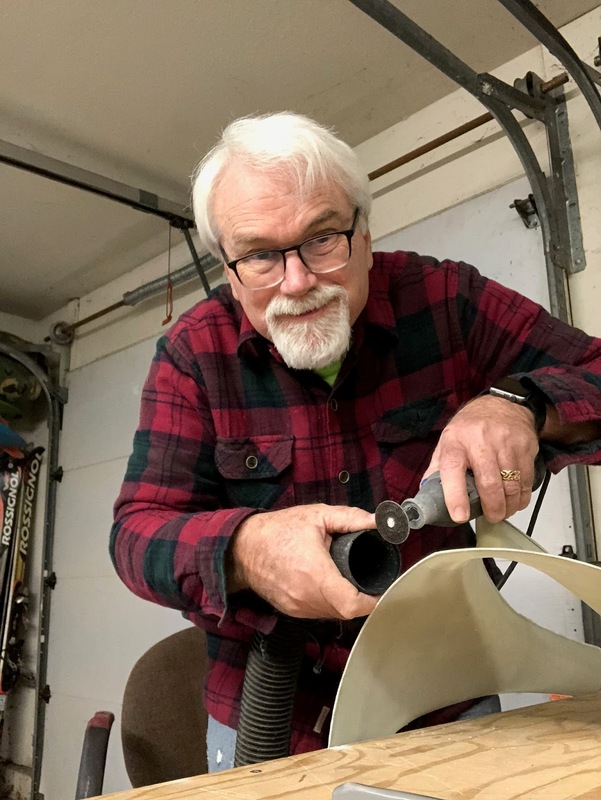 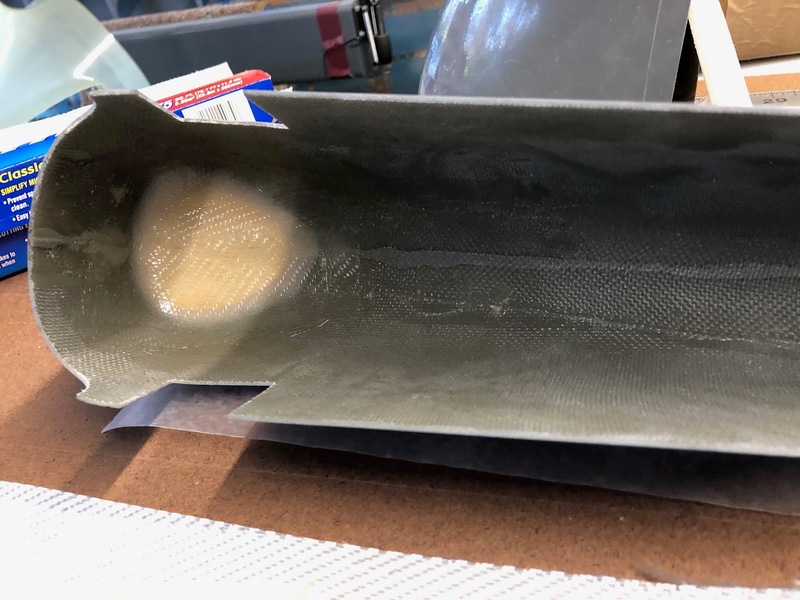 To get it into final position I gently pulled on the trailing edge of the fiberglass tip and re-set several of the duct tape strips to hold it in final position (picture below). 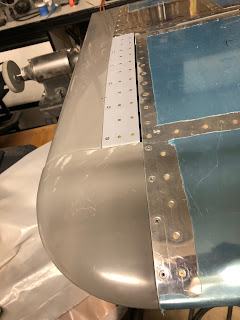 Finally I drilled #40 the mounting holes starting from the leading edge working aft, alternating between the upper and lower skin. I frequently checked the tip trailing edge alignment as I drilled and clecoed the holes. The alignment ended up spot on by the time I finished drilling and clecoing. 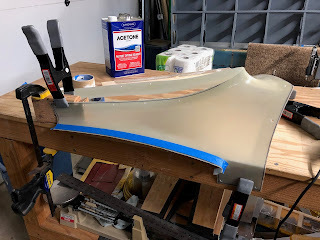 The paint cured on the parts I painted yesterday after being in the warm house overnight. This morning I riveted together the electric aileron trim module. I was able to squeeze all the rivets which made it pretty easy. 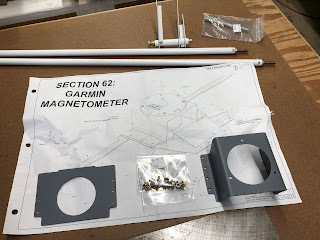 After lunch I puzzled out how to attach the Garmin GAP-26 plumbing to the pitot and AOA lines. 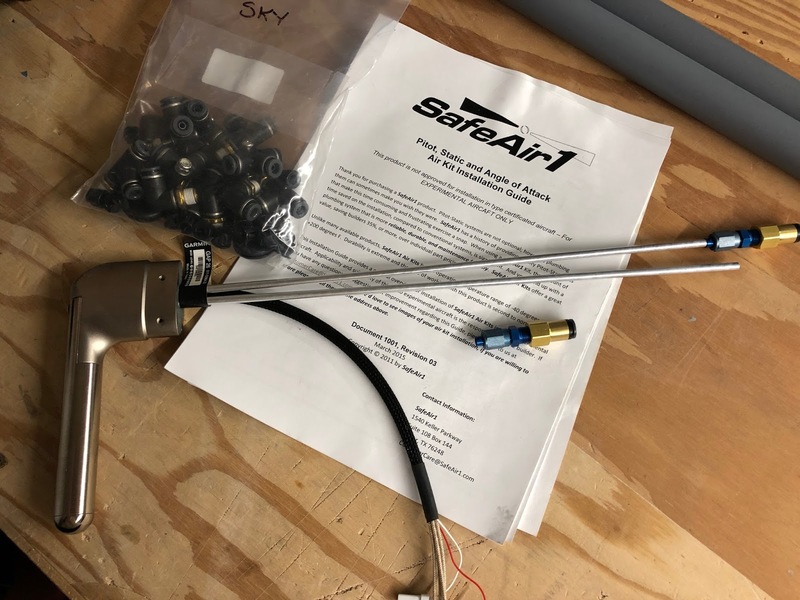 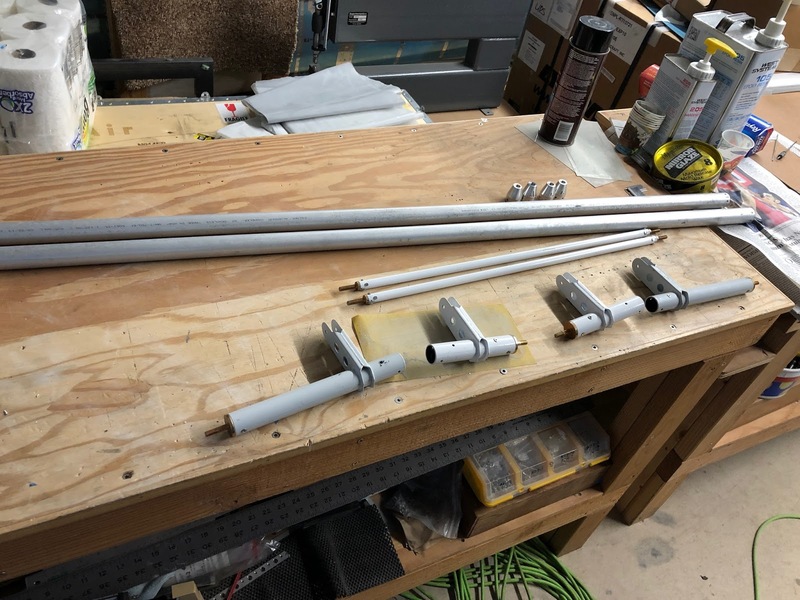 I was going to just order a duplicate of the fittings Van's provides for the kit pitot tube, but I discovered they are sized for 1/4 inch tubing and the GAP-26 has 3/16 inch tubing. 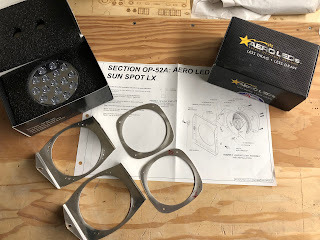 I started looking for the proper AN fittings in the Aircraft Spruce catalog - there a lot of choices. 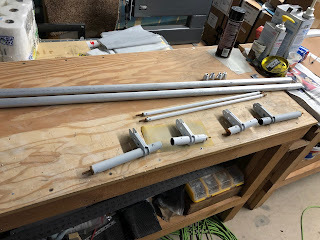 Then I remembered I had a lot of plumbing parts left over after installing the static ports. 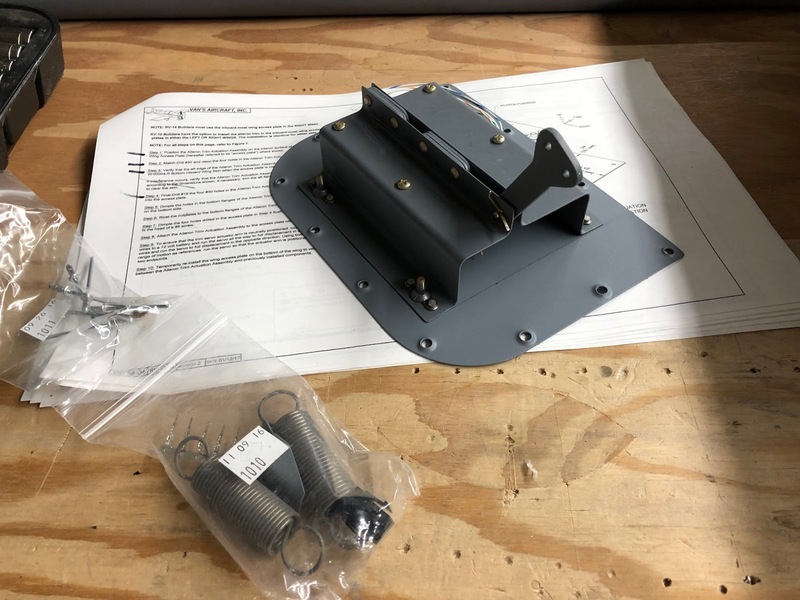 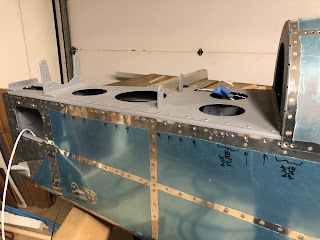 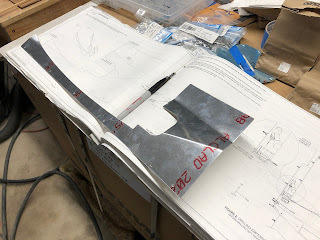 I had ordered the Avery EFIS System Plumbing kit from Aircraft Spruce when I was working on the tail cone. 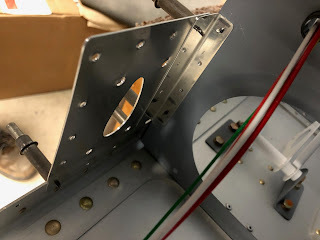 It turns out that it has fittings for the GAP-26 aluminum to plastic tubing connections. 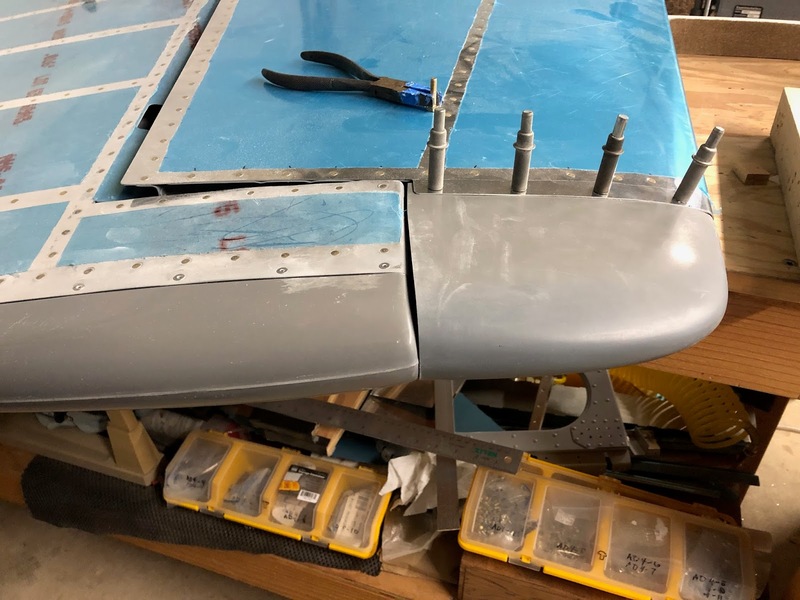 I pulled the pitot and AOA lines through the wing. 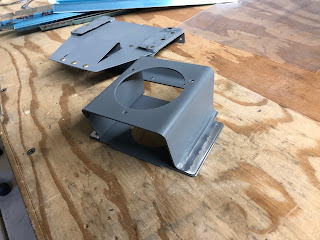 Then I worked on installing the aileron actuator on the end of the wing. 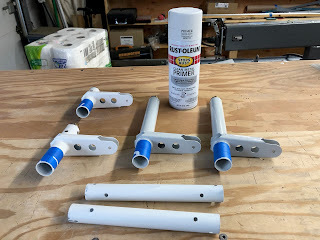 I had cleaned and primed the tubes a couple days ago. The tubes had been a close fit before painting and now they didn't fit at all. I spent a couple hours sanding primer off to get the tubes to fit together again and then applied a good coat of grease and slipped them together. When I went to fit them in the end of the wing I discovered I had to sand even more because you need to slip the inner tubing well past the mark to get the assembly to seat in the bearings. 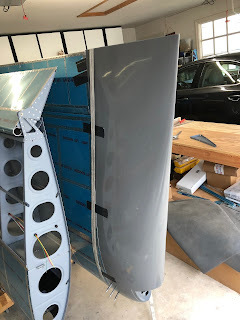 I decided to run the Van's supplied light and tip strobe wiring through the wing today so I could get an idea of how it fits. 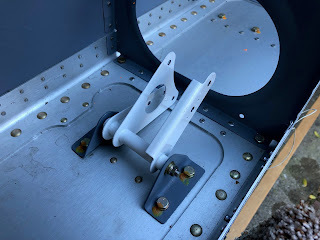 I like how the connector fits into a support bracket at the wing root. I think I will pull out the red, yellow, green and white nav/strobe wires and replace them with a 3 wire shielded cable to eliminate noise. 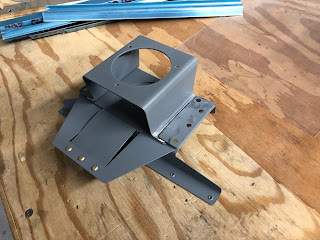 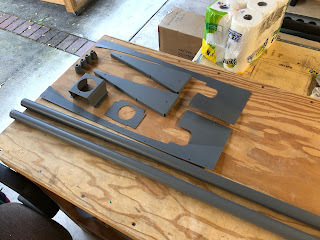 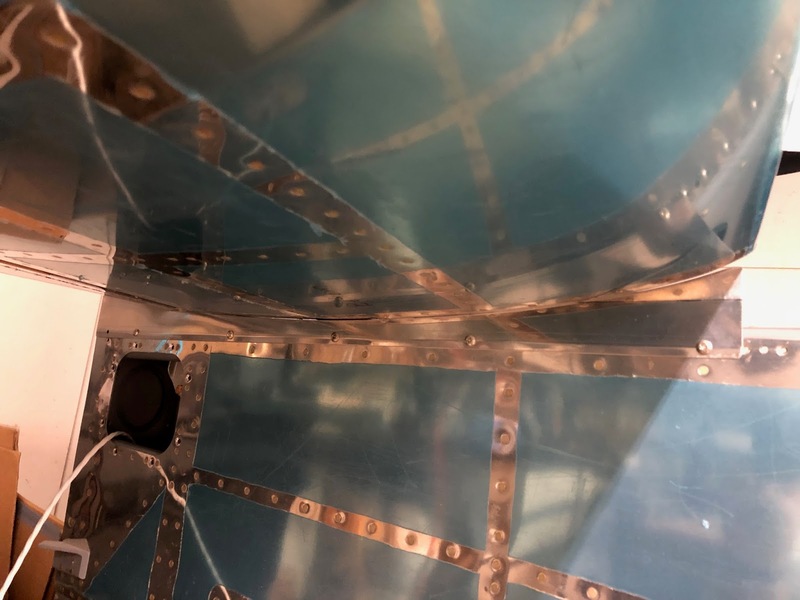 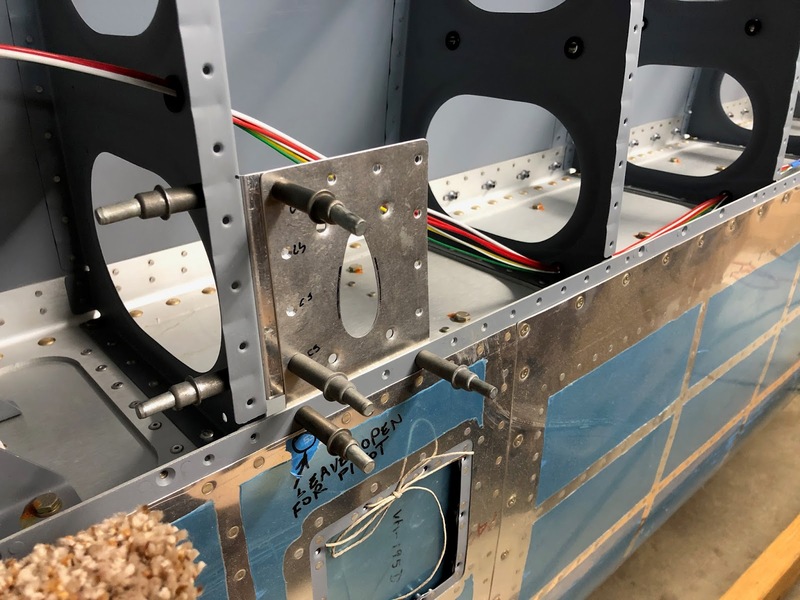 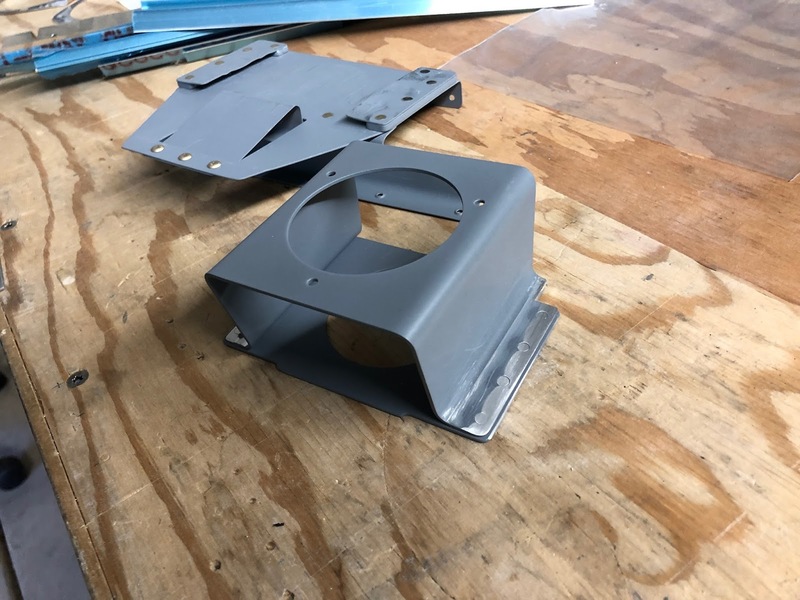 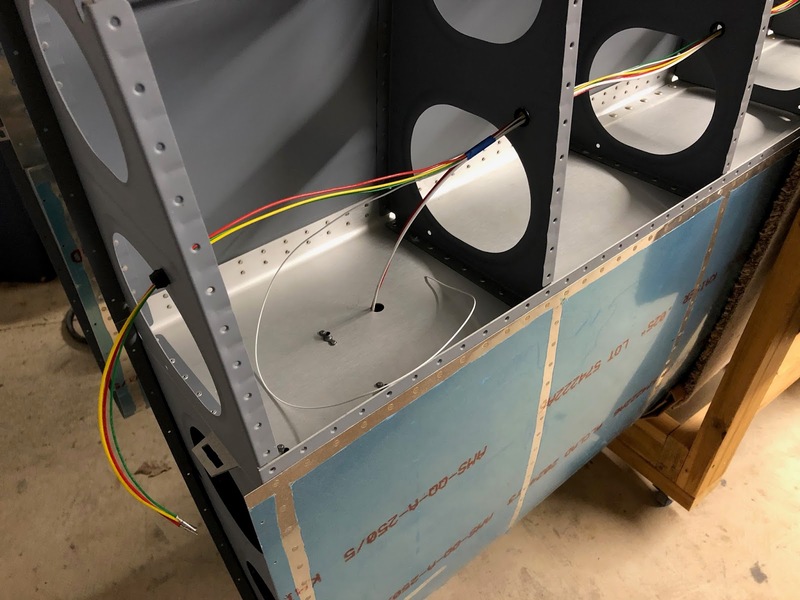 I'll tie the shield to ground on the FlyLED's controller in the fuselage and the shielded cable should fit in the existing grommets in the ribs along with the head light wiring. After fitting and match drilling the empennage fairing you do a final trim. 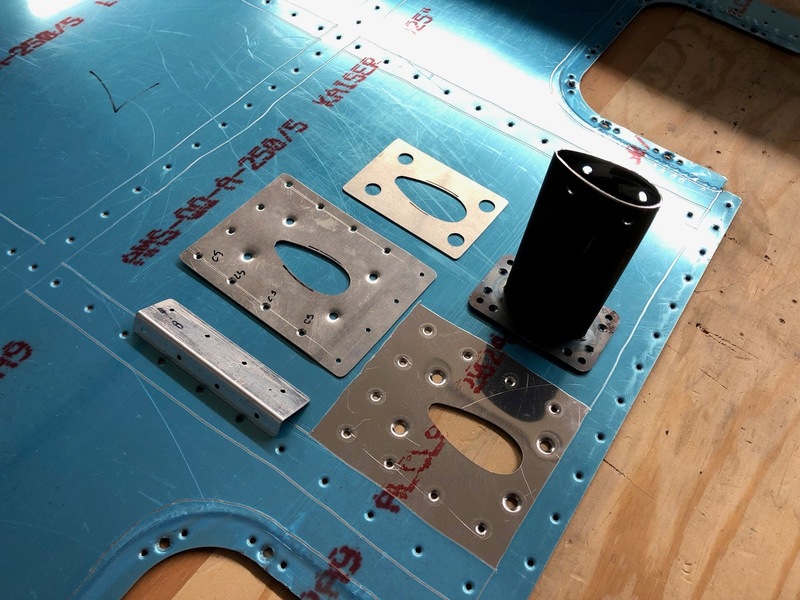 You must maintain at least 3/16 inch of margin to the center of all the screw holes. A couple holes on one side of my fairing were too close to the edge, so I had to adjust the trim line out about 1/16" in a couple places. That's why you leave a 1/8 inch margin in the initial trim. 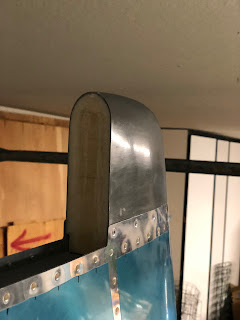 I used masking tape to mark the required trim line and cut within 1/16" with the dremel. Then I used a long board with sandpaper to sand to the tape line for a nice straight final trim. 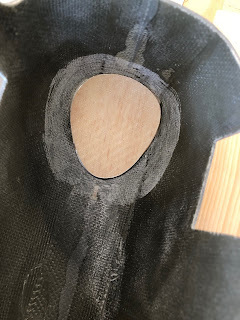 After sanding all the edges to the final trim, I rechecked the fit on the airplane and made a few more adjustments in the saddle areas to close all the gaps to less than 1/32 inch all around. 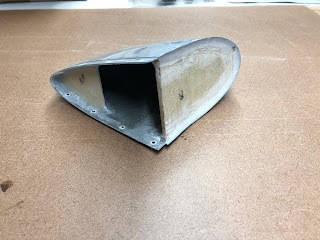 Then I applied a half round to all the edges using a sanding block to first apply a 45 degree bevel all around and then I knocked the edges of the 45 bevel off with the sanding block. I did the final rounding using sandpaper held in my fingers. 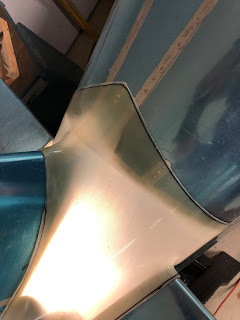 I should mention that I frequently run the shop vac to keep the fiberglass dust from accumulating (did I mention I hate fiberglass dust ?). I made a template and laid up a fiberglass/balsa sandwich panel to close the end of the v-stab tip and set it aside to cure. 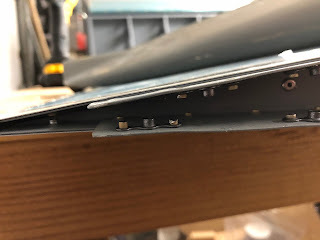 Next I sanded and cleaned up the h-stab tips. 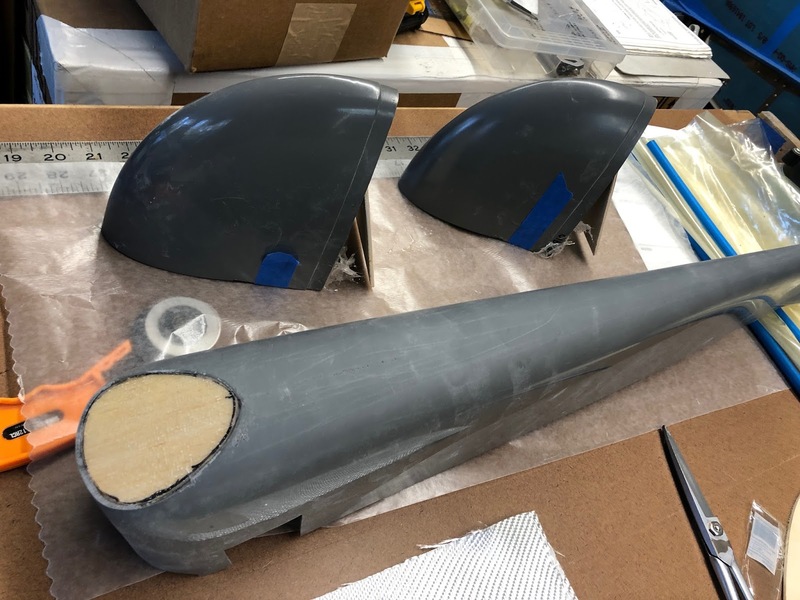 Yesterday I had glassed in a bulkhead in the noses of the tips to push them to a fuller shape. I also added a fillet of flox thickened epoxy to the round the outside face of the end bulkhead. 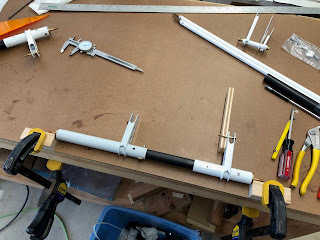 This will create a shape that allows for good clearance of the elevator through the whole range of throw. 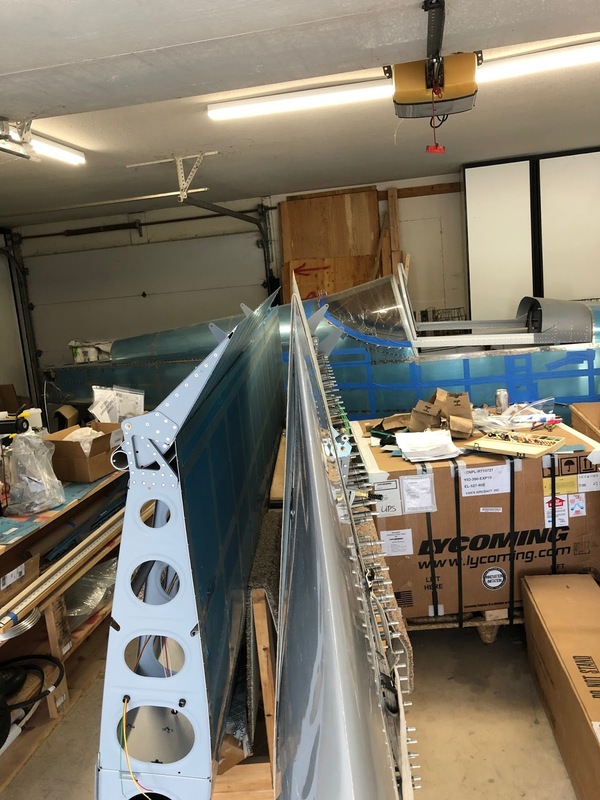 Both tips are now final fit and riveted to the horizontal stabilizer. 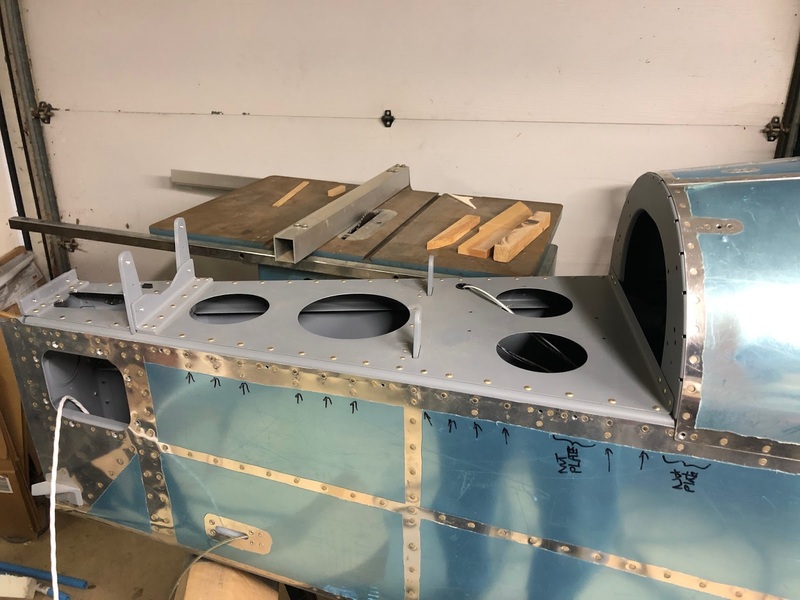 There are still a few small gaps that will have to be faired with filler, but the final fit is pretty good. 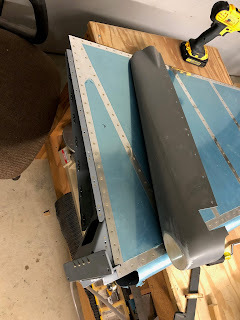 I did an initial trim and fit the vertical stabilizer tip. 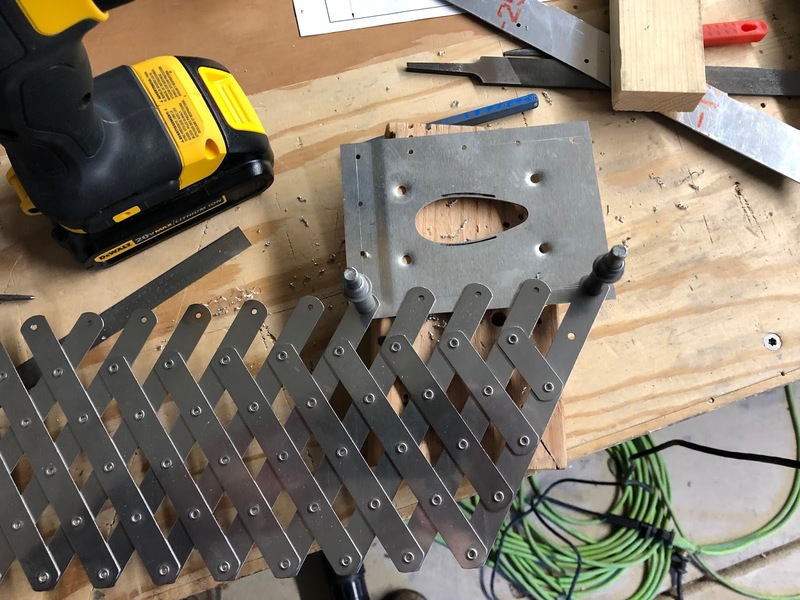 Here it is after match drilling. 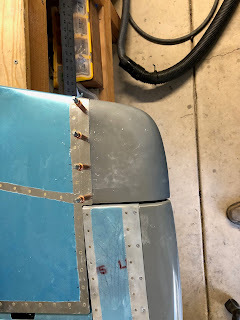 I attached the rudder before doing a final trim. 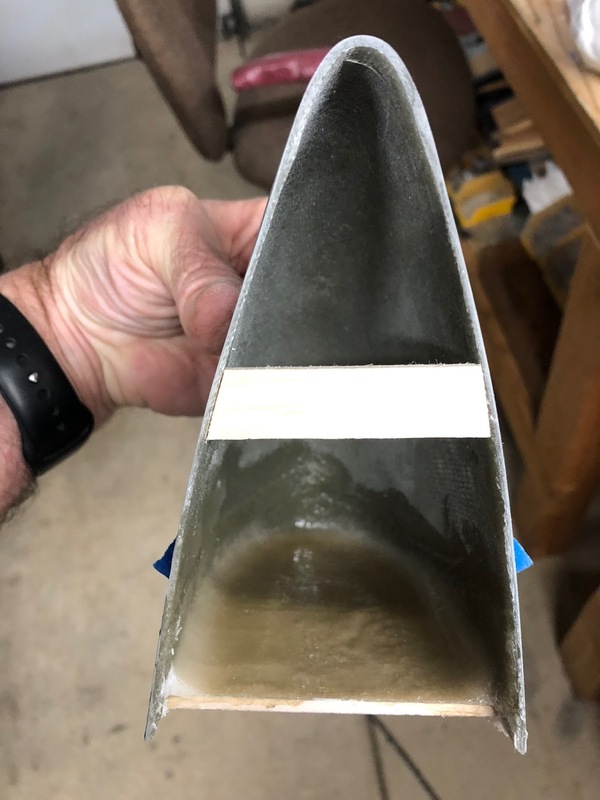 After trimming the tip now has 1/8 inch gap to rudder.